Do you have a child with the need for speed? Power Wheels and electric cars can help kids fuel their desires while working on motor skills and spatial processing. However, not all cars are created equal. We’ve collected a list of the best of the best Power Wheels and electric cars for kids. We’ll take a look at what you need to consider in a purchase, and which ones we recommend. Use the links above to check the latest prices or read our in-depth power wheels and electric car reviews below. At What Age Should Kids Use Electric Cars? Before you start shopping for your next battery powered toddler car or ride-on toy, you’ll need to know what to look for. In this guide, we’ll start with the basics and move on to discuss some things you may not have even considered. 1. What Is a Kid’s Electric Car? Wondering what, exactly, a kids electric car is? Ride-ons and battery-operated cars are small versions of the real thing. Popular brands you’ve probably heard of include Power Wheels and Kool Karz. These trucks and cars actually work. Your child can sit in them and drive them. You’ll even find off-road options, capable of working on rough terrain. There are a wide variety of electric cars on the market. Some are geared toward toddler-aged children while others are suitable for older children. 2. How Safe Are They? These cars are designed specifically for children to use. Most types are wide-set to avoid tipping and have a low center of gravity. Like any other toy or activity, there is risk involved with using electric cars for kids. However, there are things you can do to keep the activity safe (source). Establish rules before using the vehicle: Let your child know where it’s safe to use their electric car — and where it isn’t. Clearly defining safety parameters will make your child confident in the choices they’re making while also keeping them safe. Teach your child how to be safe when using kids’ electric car — and how to be safe when others are using it: Knowing how to behave both off and on a ride-on toy will help keep your child injury-free. Always supervise your child when they’re in the vehicle: Supervision can help you intercept a child who’s using a ride-on toy dangerously. Consider a helmet: Even if the likelihood of an accident is low, protecting your little one from a head injury is worth the extra effort (source). Not only that, it sets a good precedent for later activities where head injuries are more common. Knee and elbow pads may also be useful, in case any mishaps occur. Ride-on toys are available for a variety of different ages. Power Wheels and electric cars for kids are usually suitable for children ages 2–8, but each car will come with its own recommended age. It’s important when selecting your purchase that you choose one which is appropriate for your child’s age. Age isn’t the only factor you’ll want to consider. You’ll also need to take into account the height and weight of your child. An overly tall 2-year-old may have difficulty fitting in a toddler-geared car, but opting to move to a larger vehicle may not always be a good choice. Your toddler might not be ready for a ride-on made for older children. Many of these cars also come with a weight limit. Don’t forget to consider the weight of your child — especially if you’re buying a two-seater for children at the upper age limit. The best power wheels and electric cars for kids are high-tech and come with many fun features. Here are a few you might encounter while shopping. Bluetooth capability: Looking to sync a playlist to your kids’ electric car? Some models offer this option. Seat belts: Not every electric car will come equipped with seat belts or safety restraints. Looking at toys that are capable of greater speed? Will your child be on uneven terrain? Go ahead and opt for safety belts. Speed options: Some electric cars may only have one-speed option. Many, though, come with multiple gears. A word of warning — a little speed can go a long way, especially for rambunctious children. Music: Some electric cars can come with preloaded music or a fully functional AM/FM radio. Suspension and shock absorbers: Buying a vehicle you know will be for off-road use? You may want to consider vehicles that offer shock absorption and suspension systems. This will keep your child comfortable while preventing unnecessary wear and tear on the car. Towing capabilities: Some vehicles come equipped with the ability to tow other items behind them. If you have a little helper who’s interested in outdoor chores, a towing option may be ideal. Sound and lighting effects: Realism is great for children. Electric cars for kids can be found with revving sounds, working horns, and headlights that turn on and off. Additional features: There’s no limit to what you might encounter while shopping for a kids electric car or other ride-on vehicles. You’ll find gradual acceleration, themed car options, battery level indicators, and other fun features. 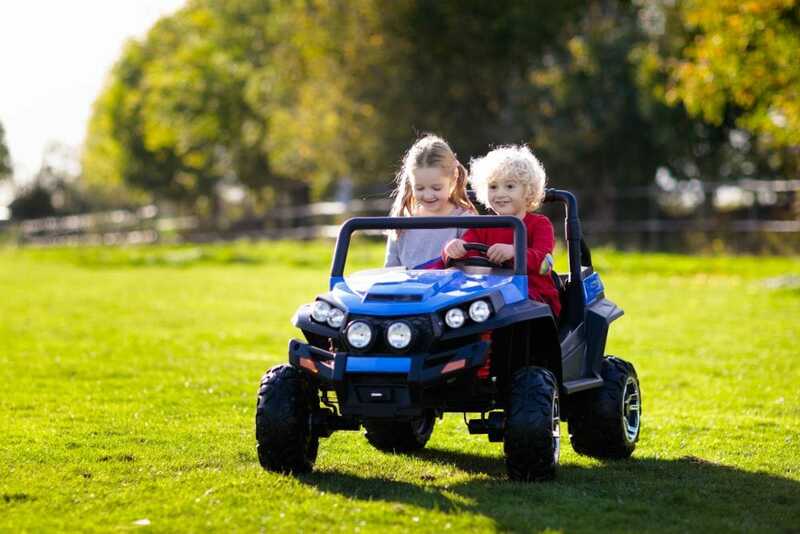 This information about Power Wheels and electric cars may give you a better idea of what products will suit your child. With your needs in mind, let’s take a look at some of our top battery operated car choices. 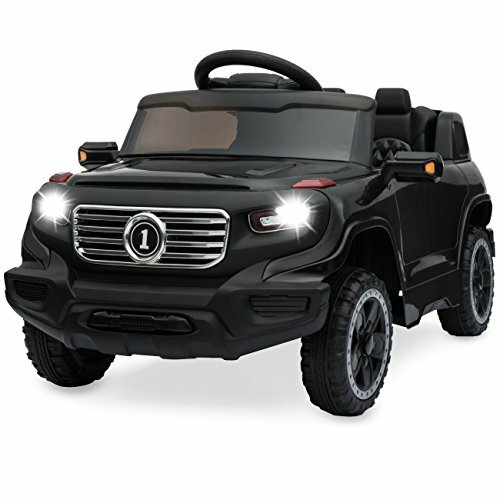 This single rider luxury model is great for one child ages 2–6 years. It reaches a maximum of 3–5 miles an hour and is suitable for children up to 66 pounds. This model includes great safety features, like a seat belt, and parental remote control. The realistic exterior and design include LED headlights, tail lights, and fog lights. The interior boasts PU leather seats and a stroller seat belt. Two speeds and a forward and reverse switch are also found in this luxury model electric car. Gradual acceleration, an electric brake system, and rubber traction help create a smooth ride. Opening doors add to the experience. A smart charging battery system helps prevent overcharging. A full charge requires 8–10 hours of charging time and provides about 1.5 hours of running time. Easy assembly that takes about half an hour. Can be remotely controlled by parents. The body of this car is easily scratched. Sometimes you need a toy that’s more than just a toy. 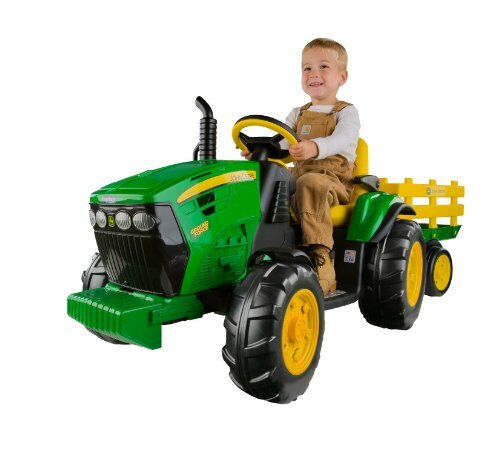 If you’re looking for a ride-on that makes your child feel like the little helper they really are, you may want to consider this tractor model. With two speeds to choose from, this tractor can travel at 2.5 or 4.5 miles per hour. You can also choose to lock out the greater acceleration for younger children or beginners. Large wheels help provide fantastic traction, even on grass and uneven terrain. The seat is adjustable and has flip up armrests. This model provides plenty of space for a growing child and can support up to 85 pounds. This model runs on a 12V battery, which offers plenty of power. It also comes equipped with 4WD and has a detachable trailer it’s capable of pulling. Hauling leaves and moving yard equipment has never been easier with your helper and this little tractor at your disposal. This product is suitable for children aged 3–7 years old and is made in the United States. A sturdy and durable ride-on that’s great for off-road use. Offers safety features for young riders, but still holds appeal for older children. Some users report the battery needs to be recharged frequently. This themed Jeep Wrangler is a great option for a Wonder Woman-loving little girl. Fun Wonder Woman graphics and a sturdy body are bound to leave your child entertained. A parent-controlled lockout system will keep your child at a speed you’re comfortable with. Features for this model include a pretend radio that has programmed character phrases and realistic car sounds. Opening and closing doors can help the experience feel more realistic as well. Storage in the back of the vehicle allows for toys or snacks to accompany your child on their backyard adventures. This vehicle seats two and has a power-lock brake system which serves as a great safety feature. The brake system has the car automatically stopping once your child stops depressing the pedal. 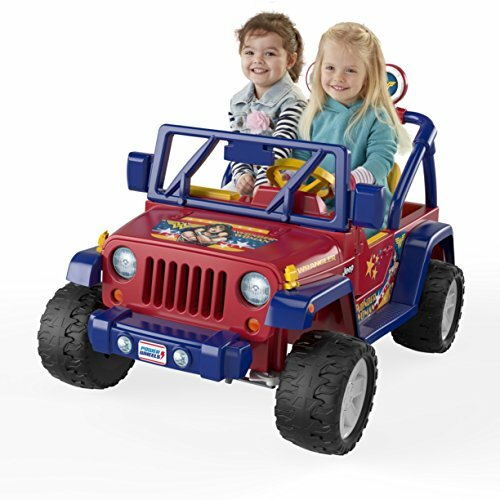 The Jeep Wrangler is suitable for children from 3–7 years old. It travels at 2.5 miles per hour (with the parental lockout engaged) and 5 miles when not locked. It can support up to 130 pounds. Suitable for grass as well as even surfaces. Realistic details, including audio and functional doors. 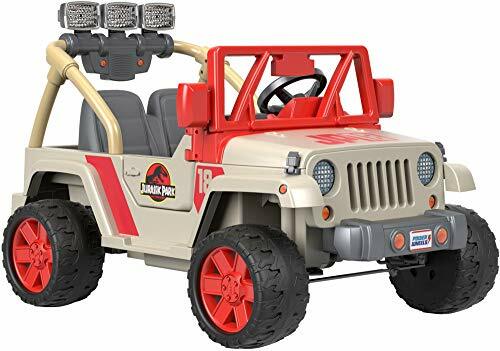 Another Jeep Wrangler, this time with a Jurassic World theme, is capable of 2.5 miles per hour with the parental lockout engaged and 5 miles per hour without. In reverse, it will move at 2.5 miles per hour. It’s great for use on both grass and smooth surfaces. This is a fun option for your kids to ride on. It has sound effects that include dinosaur roars and “chase” sounds. Your child will love the fully-functional doors. 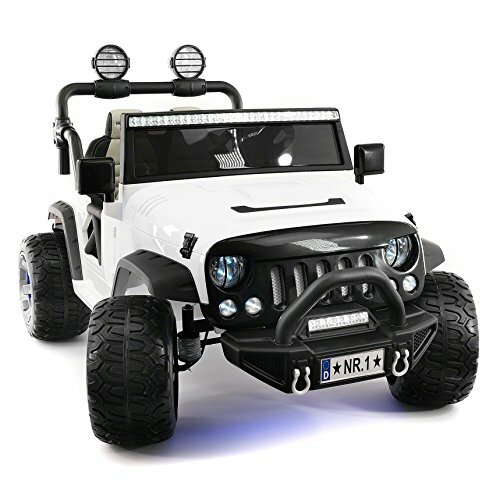 The working light bar and extra storage add excitement for your child. This model seats up to two children and can support a maximum weight of 130 pounds. 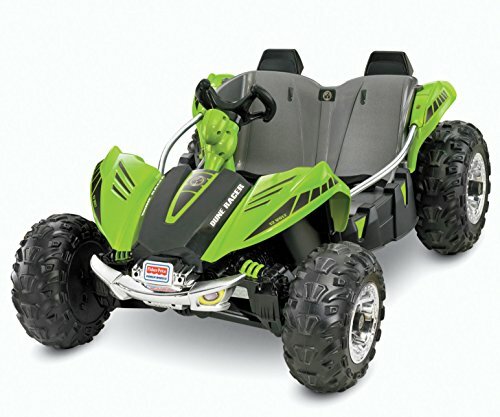 It’s suitable for children ages 3–7 years of age and runs on a 12V battery. As with all Fisher-Price Power Wheels, this one has been fully safety tested. Assembly and decal application is required. Power-lock brake system in place for extra parental control. Realistic detailing that’s great for creative play. No keys to start the car means you may have to disconnect the battery when not in use to preserve battery life. The Boomerang offers an exciting ride for older children. Its nontraditional shape takes the ride-on experience to new levels. The unique triangular build of the Boomerang allows riders to tilt and spin into safe, controlled drifts. Built for speed and fun, this unit also comes with additional safety features. High sides and an adjustable seat allow you to create the safest ride possible for your child. The maximum speed in forward drive is 5 miles per hour. This model also comes equipped with power-lock brakes and a seat belt. It’s been fully safety tested and is suitable for children from 5 to 10 years old. It runs on a 12V battery and with a full charge will net you approximately 45 minutes of running time. Great safety features, like power-lock brakes and a seat belt. Fun and thrilling rides for older adventure seekers. Many users found the battery life to be quite short. 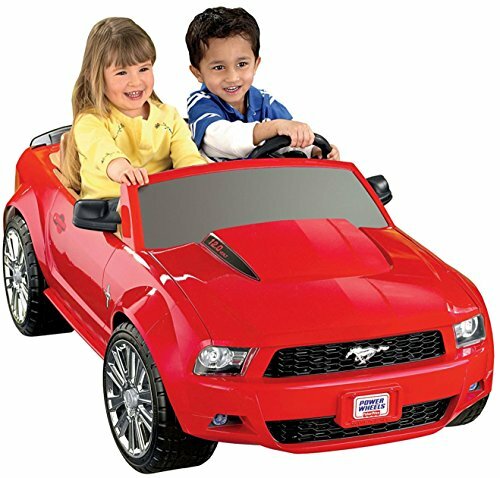 The sporty exterior of this child-sized Ford Mustang is a great option for an older toddler. It’s capable of driving on both hard surfaces and uneven terrain, like grass. This car offers two speeds, 2.5 miles per hour and 5 miles per hour. It comes equipped with a high-speed lockout, which means you can limit the speed for a young child. It’s great that this is a car that can grow with your child. As they grow and become more capable, you can go ahead and increase the speed capability. The exterior features appeal to both younger and older children. It can seat two and can support up to 130 pounds, which is also great for growing children. The Fisher-Price Mustang moves forward as well as backward. Realistic detailing, including the classic running horse and a working radio, will provide hours of entertainment. 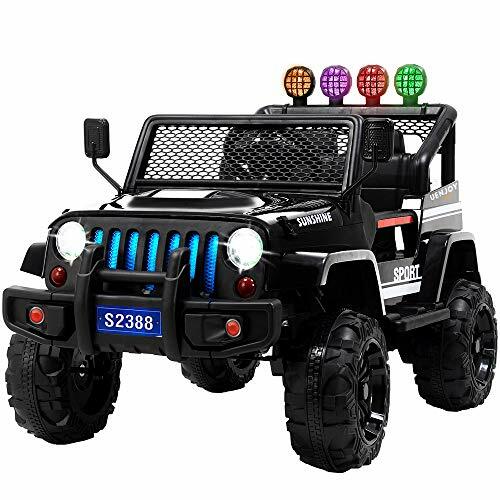 Suitable for children 3 to 7 years of age, this car runs on a 12V battery. A 1-year limited warranty comes with the purchase of this car. Will last from toddlerhood through 7 years of age. The doors don’t open — this is a climb-in model electric car. 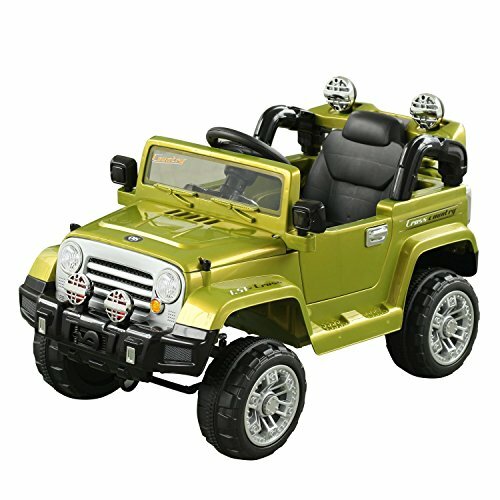 This jeep-style car is attractive and great for kids aged 3–6 years old. You can choose between three different speeds that best suit your child’s needs. The maximum speed of this vehicle is 4 miles per hour. You can also remotely control the car until your child is old enough to handle driving it alone. It’s loaded with safety features, perfect for a growing child. Made with non-toxic plastic and equipped with an adjustable seat belt, it also offers suspension. Your child will love the LED lights, audio system, and larger body style. I like the longevity of this ride-on car has. It’s safe for a young child, but has the power and features an older child will still want. The 12V battery offers an hour of driving time and requires 8–12 hours of charging time. Larger body style that’s suitable for older children. Convenient pull-handle for when you need to manually move the car. Supports only up to 66 pounds. If you’re looking for more than regular off-roading capability, you may want to try this. 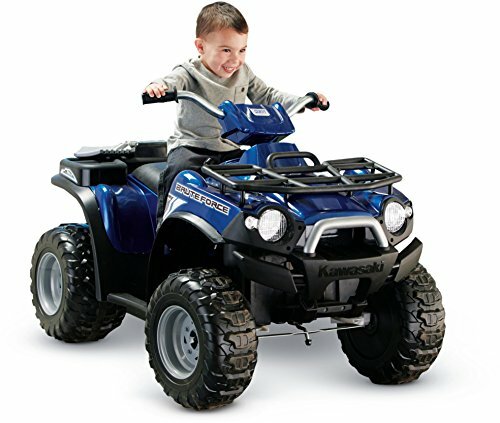 This ATV-style ride-on vehicle has a “monster traction” system that’s great for rough terrain, wet grass, and smooth surfaces. It can drive 2.5 or 5 miles per hour forward and up to 2.5 miles per hour in reverse. It also offers a parent-controlled lock-out system to limit speed and power-lock brakes to help protect your child during use. 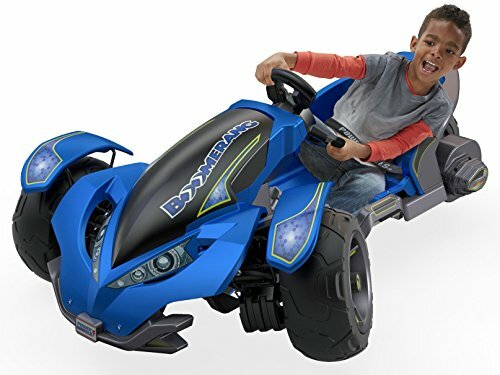 This ride-on toy is made for a single rider and can support up to 65 pounds. It’s suitable for children aged 3–7 years and uses a 12V battery. It’s a great choice for taller children as they won’t be restricted by the space allotted in a sit-in style car. Great potential for years of use. High-performing even on difficult terrain. Requires more balancing skills than sit-in style ride-ons. This off road truck is great for kids aged 3 to 8. It offers a remote control feature and can also be driven manually by your child. This ride on vehicle will support riders up to 66 pounds. The truck is packed with great features. An incredibly roomy and comfortable seat, equipped with a seat belt, is perfect for a single rider. The mirrors are functional and movable, and both the doors and the horn work. Dashboard lights, a high/low-speed switch, extra storage, and a power indicator round out this product’s features. A powerful 12V twin motor allows for great rear-wheel drive and increases performance even on uneven or wet terrain. A built-in MP3 port allows you to supply your own soundtrack to your child’s backyard fun. Plan to charge this for 8–12 hours or overnight, and you can expect to have 45 minutes of riding time per charge. Works well on most terrains. Equipped with a seat belt. Finding a budget-friendly ride-on is entirely possible. This model has great features and it won’t break the bank. An easy to operate start-and-stop button make driving easy — even for a beginner. A remote control with three different speed options can help you create safe riding conditions for your child. The working horn, lights, and AUX jack add to the appeal. This vehicle can seat one rider weighing up to 44 pounds. It runs on a 6V battery and is ASTM certified. Recommended for children ages 2 years old and up, this is a good option for a younger or more petite rider. This model maxes out at 2.5 miles per hour. It also has a safety belt and a bench-style seat to suit your child. It’s capable of moving forward and also has a reverse function. Great safety features for a younger child. Some users report the battery life doesn’t last very long. 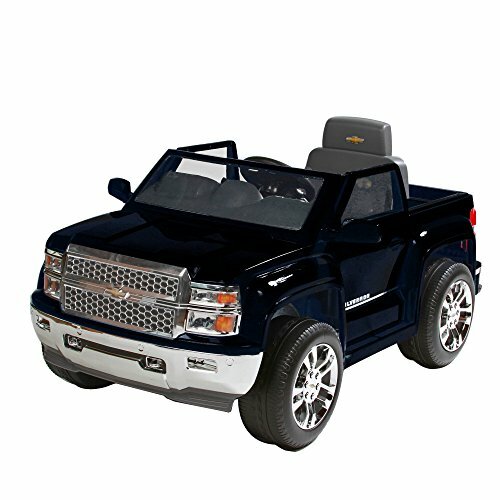 This Chevy Silverado ride-on toy comes in several different models though we’ve stuck with the one-rider 6V option. You can also choose a 12V option that seats up to two children. All models are rechargeable and come with an integrated battery life indicator. Recommended for children ages 3 years and up, the 6V ride-on truck can accommodate up to 77 pounds. It reaches a maximum speed of 2.5 miles per hour and moves forward as well as in reverse. Additional realistic features include functional doors, a working horn and sound effects, and an illuminated dashboard. Cup holders, clear windows, rubber traction strips, and chrome rims round out the luxurious details. Additional storage space in the rear makes it easy for your child to bring along everything they need. Not short on luxurious details. No remote for parental control. This Jeep Wrangler has a flashy exterior and comes with Hot Wheels colors and graphics. The chrome detailing adds to the realistic experience, as do the sound effects. This is a great option for two children, the cab is roomy, and there’s plenty of storage space in the back. The 12V battery gives this car plenty of power, and it’s well-suited to even or rough terrains. This car can travel at 2.5 miles per hour or 5 miles per hour to suit your child’s needs. This unit is equipped with a power-brake system that brings the vehicle to a stop when the foot is off the accelerator. The wide-tread tires help create a stable base and prevent tipping while improving the car’s balance. This vehicle is recommended for children aged 3–7 years and can support up to 130 pounds. Lots of legroom for a growing child. Fully safety tested by Fisher-Price. Plastic wheels aren’t very durable. 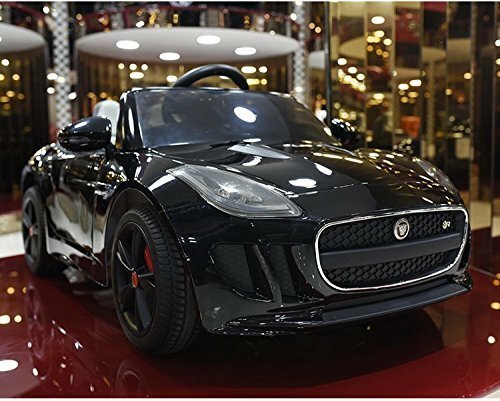 This Jaguar-style ride-on toy offers plenty of luxury. From the dual-colored rims to the leather seats, this is a sporty ride that plans to deliver. Great for children aged 2 to 4 years old, this car can support up to 66 pounds and comes with a five-point harness seat belt. Three speeds (2, 3, or 4 miles an hour) and a remote control option make this safe even for young riders. This car can also operate in reverse. A working radio and functional rear and front lights add to the realism and fun for your child. Foam rubber tires and a suspension system help keep the ride smooth and comfortable as well. This car runs on a 12V battery and even has a small trunk to store your child’s favorite traveling accessories. The Jaguar insignia, car keys, and floor mats help keep the car feeling realistic for its young driver. Luxurious upgrades and lots of power. Great safety features, even for toddlers. Paintwork is said to scratch easily. Only one child can fit inside. This ride-on truck has great, wide wheels that provide stability and will work over even or rough terrain. It’s available in a wide variety of colors and is packed with features. This model offers functional doors and seats two children. It can support up to 100 pounds and it’s suitable for ages 3–6. The electric car runs on a 12V battery that has overcharge protection. This truck runs between 2 and 5 miles per hour and offers luxurious upgrades. It comes with adjustable PU leather seats and a convertible seat belt that works for either one or two riders. A parental remote control option helps keep your child safe. Additional features include shock absorbers that help ensure a smooth ride — whatever terrain you encounter. It also has LED light systems and foam rubber tires. An integrated MP3 player has Bluetooth capabilities and lets your child choose the perfect soundtrack. Gradual acceleration and a reliable brake system. Has an on-screen digital battery-level display. This Fisher-Price Dune Racer is fully safety tested. It offers two seats and side rails to help keep your child safe during use. A 12V battery offers the power you’re looking for. It’s capable of traveling 2.5 or 5 miles per hour and will travel in reverse at 2.5 miles an hour. It’s a great option for children between 3 and 7 years of age, with a weight capacity of 130 pounds. This unit sits low to the ground, which is good for maintaining balance and preventing accidental tipping. Its unique dashboard-less design will enable your child to get more use out of it, even as they grow taller. This off-road model offers a “monster traction” system and plastic tires that do well on uneven terrain — even on wet grass. A great ride-on option for older or taller children. The plastic wheels slip on hard surfaces. We’ve rounded up some of the most frequently asked questions and answered them for you below. How Fast Do Electric Cars Actually Go? This will depend on the size of the battery. A car that runs on a 6V battery will usually go 2–3 miles an hour. A car working with a 12V battery can go up to 5 miles an hour. An average-sized 12V battery generally takes 12 hours to charge fully. How Many Different Types Are There? 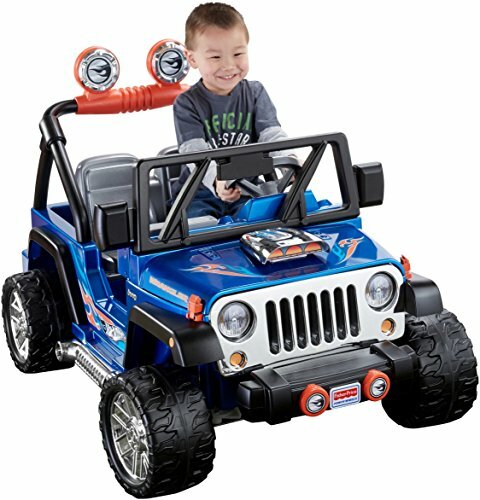 There are a variety of Power Wheels and electric cars for kids available. Some have been modeled after existing cars and have their names, such as Jeep, Chevy, Lamborghini, and Maserati. Ride-on toys aren’t limited only to cars, though. There are pickup trucks, tractors, sports cars, ATVs, and other three and four-wheeled options. You can even find non-traditional, two-wheel options. For the sake of this article, however, we’ve stuck mostly with four-wheeled vehicles. Like a car battery, it’s possible you’ll need to replace your battery at some point. This likelihood increases if you have multiple children using the car over many years. Most batteries will last you at least three years. You’ll be able to replace it and continue using your existing kids ride-on, rather than purchasing a new vehicle. Be sure to follow the manufacturer’s recommendations on how frequently to charge the battery. When it comes to choosing the best Power Wheels and electric cars for kids, there are quite a few options out there. Hopefully, this article has helped narrow down some choices that will work for you. 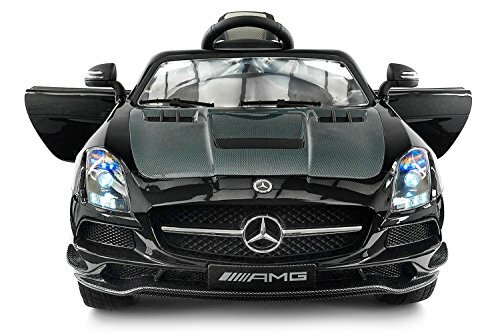 While all of these can be great additions to your outdoor toy stash, my personal favorite is the Mercedes Benz car for kids. I love the luxurious upgrades it offers as well as the greater speed and power options for my older kids. Does your child have a ride-on toy? Did you? What do you love about them and what do you wish they also had to offer? We’d love to hear your stories — leave us a comment below!